The stories in Alex McElroy’s Daddy Issues deal frequently with masculinity, memory, and the loss of the past. These stories predate the 2016 election, but the way that the past—both generational and personal—weighs on its characters and narrators calls to mind the (erroneous) notion that America was once “great.” Its characters tend to know better: the adults are haunted by their infidelities and find their childhood pleasures have soured as adults; the children have the choices and mistakes of past generations, sometimes literally, weighing upon them. The first of these stories, “The Death of Your Son: A Flowchart,” is the most formally experimental. With each question in the flowchart, each version of “No” leads always to the answer “Your Son Is Alive,” whereas each “Yes” takes us further through the life of its protagonist, Jonathon Hudson: his birth, his infidelity with a past love, his obsession with the woman he cheated with. In the background his grandfather dies and his brother becomes an alcoholic, culminating with Jonathan’s son dying under the brother’s care. The refrain of “Your Son Is Alive” drones on, hopelessly out of reach on the right side of the page, both the most repeated phrase in the story and one we know will never again apply to its protagonist. The flowchart is a surprisingly effective narrative tool—connecting discrete fragments of life, propelling the story along, and, by the end, eliminating the possibility of choice, with only one answer, irresistibly leading to the end. In another stand-out, “A Man and A Man,” two childhood friends—one a celebrity and one a “sad man”—go to a bar to “pretend they were (still) friends.” After tensions rise between them, the sad man accuses the celebrity: “Remember when you were in love with my wife?” The celebrity responds, not missing a beat, “I am still in love with your wife . . . She is why I became a celebrity.” The celebrity then reveals that the man’s wife is literally ten thousand birds, and that she will surely leave him because “ten thousand birds, they cannot be caged.” When he returns home, the sad man hears an immense flapping coming from their bedroom, and when he opens the door, finds nothing. The story convincingly tackles competitive friendships between men, relationship anxiety, and celebrity culture, transitioning between topics incredibly smoothly. McElroy slips slowly, effortlessly into fabulism, transitioning from a largely plausible encounter to something more sinister. The sad man’s disbelief closely mirrors the reader’s, easing the transition: he pores over memories of her, searching for particularly birdlike qualities, but arrives at no conclusions. We share his disconnect from the world he’s stuck in, but the story is so matter-of-fact about its fabulism, we aren’t able to question it any more than he is, standing there in the empty room. 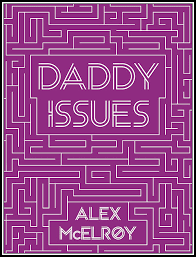 The title story, “Daddy Issues,” appears at first to be only a list of afflictions suffered by or in relation to fathers. These range from the mundane (a stubbed toe) to the political (death by drone) to the personally tragic (a retired football player’s memory slowly deteriorating). At the list’s end, we see all the fathers summoned by God to a barn in Nebraska, where he scolds them that “[their] issues are not really issues at all,” where he blames them as “weak . . . distracted, noncommittally disciplined.” He offers useless solutions to their problems—one who cannot feed his children should get a better job; another should have stronger willpower—and when the fathers rebel, God sets them on fire, decreeing that “he who becomes a daddy will be drawn to the barn eternally burning.” Throughout the world, all are left desperate to avoid fatherhood, lest they, too, be consumed in flames. This story calls to mind issues of toxic masculinity and of the expectations forced on future generations, as well as the ways that we make the same mistakes, suffer the same consequences, as our parents before us, punished by God the Father for our transgressions. Throughout much of the chapbook, men are haunted like this by some combination of past and family. In “Popi to Life,” a boy named String brings his grandfather, Popi, back to life by having his corpse watch TV (which is illegal). Popi does not recognize him, only wants to watch more TV, and so String slaps at him, hoping that Popi will “[tear] through his restraints and [stab] his fingers into String’s chest,” that “maybe the taste of his heart would shake a memory loose.” His brother, Lester, who dropped out of high school and has taken care of String since their parents’ death, barges into the garage that String and Popi occupy, dismembering Popi’s zomboid form with an axe. The story is a dense array of details and relationships, but it’s suffused with conflict between the need for the past and the danger that this need creates. “The only way to be safe,” Lester tells String, “is to destroy what’s looking to harm us,” referring to the past. Lester hopes to take care of his brother so that, cliched though it is, String can have a better life than he did. And that means relentlessly moving forward: past the deaths of their parents, past the death of their grandfather. This need lurks around the edges of the story, present even in details such as the brothers’ avoidance of ever explicitly mentioning their parents’ absence. The chapbook’s title, of course, evokes a troubled childhood, but the collection as a whole is more concerned with cycles, where the past is “a fragile, dangerous comfort, like a warm blanket made out of spiders” and the future inevitably becomes the same. It calls to mind other fabulists concerned with the weight of familial relationships, writers like Matt Bell and Blake Butler. McElroy’s stories are frequently funny but grotesque and disconcerting, heightening their absurdity all the way to the end, while dragging these men to impossible—yet somehow plausible—lows. Crushed under the weight of the past, both their own and their fathers’ before them, they can only collapse, or transfer the weight onto sons of their own.